In-Ground Hinged Highway Delineator Post. Seven sizes. Available in Red, White, Yellow, Brown, Blue, Green, Orange or Gray. This all-weather delineator can take up to 100 car hits at 55 MPH. Unbeatable in areas where ordinary markers suffer high failure rates. 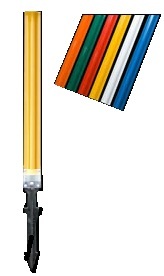 The post is a color impregnated, UV stabilized polycarbonate extrusion - impact-resistant to 80 mph. The hinge is hi-density, all-weather polymer, mechanically fastened to a patented barbed anchor that really stays in the ground. The anchor is a high-density polymer that is unaffected by adverse soil conditions. Easy to install: Dig 18-inch hole and bury marker to half-way up hinged part of post.